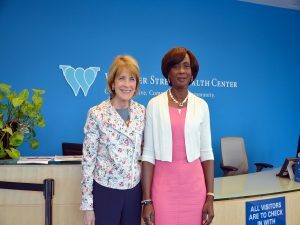 On May 28, 2014, Attorney General Martha Coakley met with Whittier Street Health Center’s President and CEO, Frederica M. Williams, to discuss the continued increasing demand for mental health services, which is at a crisis level in urban communities. Whittier was recently awarded a $250,000 Behavioral Health Grant by the Attorney General’s office to improve its delivery of mental health and substance abuse services to underserved populations by developing a Behavioral Health Urgent Care component within its existing Urgent Care Clinic. The new service will treat same-day behavioral health emergencies that do not require a hospital emergency department. The center services Roxbury, Dorchester, Hyde Park, Jamaica Plain, the South End and Mattapan.